Weld-On Hinges Are Stronger Than They Look! Ever wonder how much those little bullet hinges can hold? Have you ever pondered how many you might need for that trailer lift gate or bbq lid? Our line of Weld-On Hinges are incredible strong and easy to install, if you’re a welder. Using our handy Weld-On Specs page, you can easily determine how many hinges you’ll need, and what size they should be. We often find, though, that the right hinge looks too small, so our customers usually use a hinge that’s one or two sizes larger than they need. Do you have questions about hinges? Need help picking the right one? Still not sure if a weld-on hinge is the right one for you? Call us today at 1-800-318-1119 and we’ll gladly walk you through the selection process to pick the right hinge for your specific application. We’re here to help! SSP Series Hinges are ALL STAINLESS STEEL bodies with a Stainless Steel pin installed. They even have a stainless bushing for a completely corrosion-resistant assembly. For a stainless steel enclosure, use the stainless version of our popular Weld-On hinges! 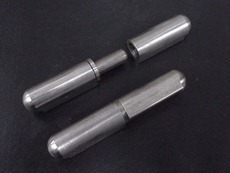 Available in a range of sizes from 40mm (1.58”) long to 200mm (7.87”) long, with a stainless pin installed! Easy to install and enormously strong, these hinges require very little maintenance or adjustment. Weld-On Hinges are adaptable to many applications- need an all-stainless hinge for your stainless steel enclosure? We have many of them in stock! Call us today toll-free at 1-800-318-1119 for more information, or use our contact form to request more information and pricing. The FBP Series hinges have a steel body, but feature a BRASS pin for smooth operation and corrosion resistance. Weld-On Hinges pack a lot of strength into a relatively small form. These hinges are enormously strong, easy to install and very cost-effective. Why a Brass pin? Brass isn’t as prone to corrosion as steel, and requires less frequent lubrication and maintenance. Don’t want to use brass? NO PROBLEM! 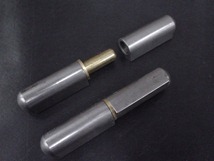 You can order a standard STEEL pin and add a grease fitting to the hinge! 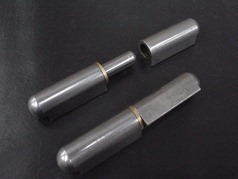 We supply many sizes of hinges with grease fittings installed. Call us at 1-800-318-1119 or use our contact form to get more information.